There is a saying in the Apple community, that once you go Mac, you never go back. Three weeks ago I went Mac and I thought that I would write a little about my experiences. It was probably the longest switch over in history as I had been slowly but surely dabbling in Apple products since I was given an old iPod about 3 years ago. I have written many a blog on a tiny iPod touch whilst away from home. I always wanted Apple products but they cost too much money to someone who was happy putting up with what they already had even though it was always substandard. I had my concerns of course. 20+ years of using Windows and with lots of files and software all backed up on my creaking hard drive. Of course, much of the data is never used but it was nice to know it was there and being a writer, there were all sorts of works in progress and articles that I had written and published in the past. Several thousand photos too amongst other things. There were also the worries of starting off on a new system that I knew nothing much about and had no huge collection of software for. Of course I knew I wanted to switch over and it wasn’t as if I ever liked Windows or never used computers before Windows. I remember Dos, I had 3 Amiga computers that were all much more use-friendly and which at the time only had one real competitor, Apples of course. Before the Amiga’s I had a Commodore 64 and on Christmas Eve 1980, I received a Vic 20 computer. A 6 year-old with a computer in 1980… who says only kids today grow up with computers, some of us were on the ball 35 years ago! In the end working with my ancient PC became impractical so I had to upgrade and as I had become increasingly happy with my iPod Touches and iPads. They never crashed, they always had all the software I needed, they were fun to use and as I don’t buy many consumer products I’m happy to pay more for something that will work well and last a long time. I’ve also noticed that several of my friends who have used Apple phones and tablets who have switched over mostly due to costs have been generally unhappy with them. So I found myself in the local Apple Store. It was only the second time which I had entered it, the first being several years ago when the creator of the new Star Trek films said that the bridge of Enterprise makes the Apple Store look uncool. In the end, he wasn’t lying but the Apple Store was still a memorable place to visit and 4 or so years later, I was going to get an iMac. I was all prepared to spend a lot of money on the justification that I would keep the machine for a long time and that I spend 12 hours a day working on it at home so even the new Retina Display machines wouldn’t be a total indulgence, well maybe just a little bit. 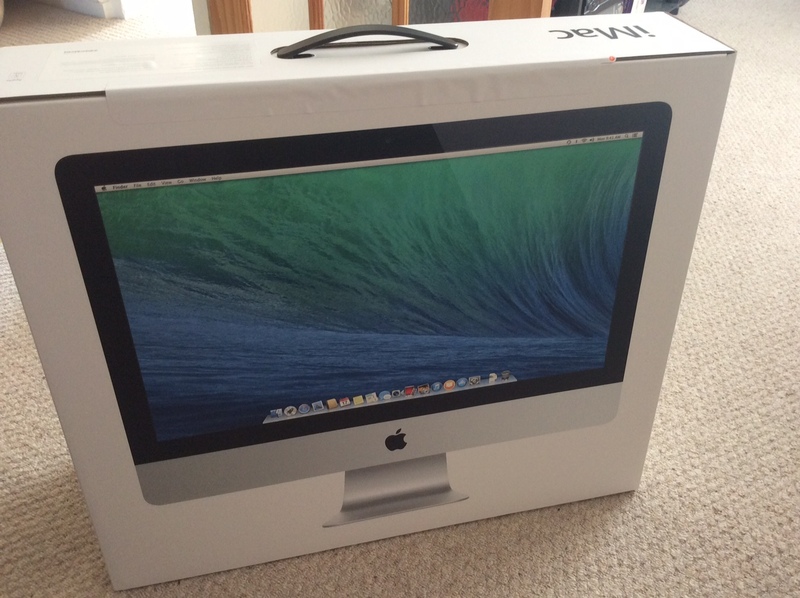 As it happened I came away with the second bottom iMac model and half of my money too. The shop assistants were very pleasant and helpful and they were very honest over which machine I needed and unlike many places, they didn’t point me in the direction of an expensive product, in fact I paid a bit more for a slightly better model than they said that I would need which they already assured would last me 7-10 years. It was quite shocking, I’d had something similar earlier in the summer when I got a second hand car and I assumed that was because I purchased it hundreds of miles from London. I’m a firm believer that such unpressurised sales is a beneficial in the long term as otherwise I would like have walked out… as it is I know exactly where I will go for my next car and likely another computer too. The iMac was boxed up and though they offered to set it up for me, I decided to take it home and do it all myself. I got quite a few stares from people as I was carrying it back to the bus but having decided to buy a computer, I’d rather actually have a reason to go in the Apple Store than buy it on the internet. V’ger is that which seeks the creator…. a Star Trek gag for those whose wondering what I am on about. I registered the iMac and it instantly recognised my wifi network and my other Apple products. Then began the 19 hours process of automatically copying over every relevant file I wanted from my PC over the wireless network. It came to about 180Gb so I was glad it was all automated. The next morning I excitedly checked and it was all ready, I unplugged the old PC and installed the new iMac. It is a thing of beauty, sleek and hi-tech looking with no wires or boxes or whirring fans. However, everything was different and I spent a whole day just working out the basics. The mouse was different, the keyboard too and just where were the files and whatever the things were on a iMac that let you do stuff? Well I soon got to know the basics. The iMac is extremely intuitive and use-friendly and there is nothing I have encountered which makes little sense or is harder to use than even on the new Windows PC I used at work last year. Everything is different but everything seems to be easier and more fun to use once you know what you’re doing with it. I ditched MS Office as quickly as I could and already enjoy Pages and Numbers more than Word and Excel. I can’t pretend that I know all the tricks that I used to know but each time I come across a new requirement, it is easy to find the solution. There is great file compatibility too so I can still read and write in Windows file formats when I ever want to. I realise that some of what I will say is because it is a new computer but it’s not entirely just because it is a new computer. I’ve had a variety of new computers since 1980 but this is the first since about 1994 which I have enjoyed learning and which is totally intuitive. There are just no problems with it. I have worked on it now for about 85 hours a week for 3 weeks and not once has it crashed, frozen or done anything unexpected. A big bonus for me of course is that it all works well with my iTunes account and other Apple devices. 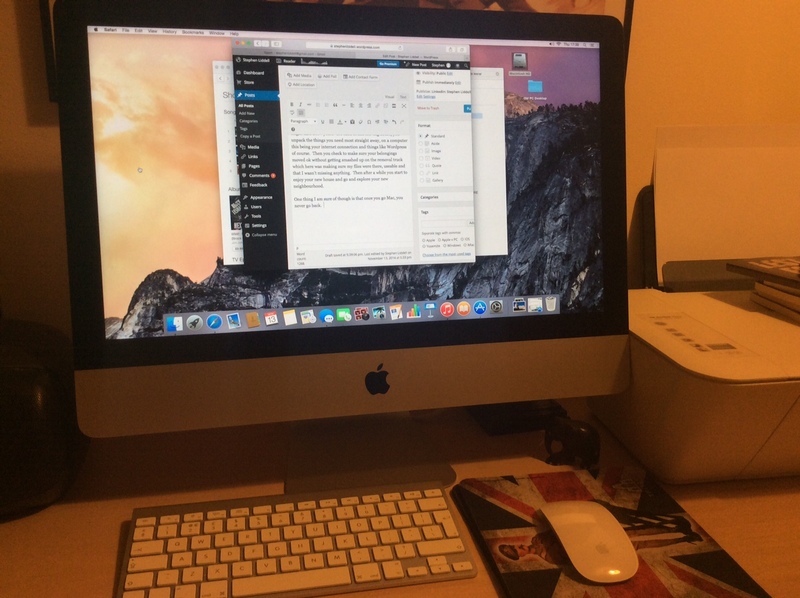 My new iMac, works like a dream and I entirely love it. I can see now why Macs are so highly praised by creative and artistic types. There are still lots of things I don’t know how to do (the file tree structure and Finder for starters) and there are probably lots of useful features and software that I don’t even know exists yet. I try to take out a little time each week to go off exploring into Launchpad and other places but the truth is that I am always so busy that I know I will probably not learn most things until I have to know them and that might take a few years. It’s kind of like moving house, you unpack the things you need most straight away, on a computer this being your internet connection and things like WordPress of course. Then you check to make sure your belongings moved ok without getting smashed up on the removal truck which here was making sure my files were there, useable and that I wasn’t missing anything. Then after a while you start to enjoy your new house and go and explore your new neighbourhood. One thing I am sure of though is that once you go Mac, you never go back. If you’re one of the several people who left comments after my previous post or who emailed me afterwards, I really recommend making the switch. This entry was posted in Life, Science and Engineering and tagged Apple, Apple v PC, iMac, IOS, Once you go Mac, Windows, Yosemite, you never go back. Bookmark the permalink. 15 Responses to Once you go Mac, you never go back! I KNEW you would love it. I’m happy for you and your new assistant. Yes, we’re very happy together 🙂 It’s an incredible machine and well worth the wait. Congrats on a new computer! It’s always fun to learn and use a new toy 🙂 I’ve considered buying one, but I”m not sure what the graphics are like in pages or any other tool on the make. I write CV’s and resumes and use color, shading, graphics, lines, color and other designs. If you have any input or would like to share let me know. And have fun learning! Hope you are well. thanks for commenting. I’m very good thanks and hope that you are too. I am really enjoying my new toy and I find Pages really easy to use and with much better help than MS Office. I haven’t tried that aspect of Pages yet. I can see from the templates it has that it definitely has the ability to incorporate colour boxes, graphics and special effects. It really is though like learning everything from scratch all though easy to pick up and remember, my problem is forgetting the instinctive way of doing it the Word way. However I am forever free of the Word indents, paragraphs and margin problems that plagued me for 20 years! You can get Word on iMac and even just get a licence for 1 year which would give you all the time you needed to find out how to do everything on Pages. I have my old PC under the bed just incase but in nearly a month haven’t come close to needing to boot it up. Since buying a new computer with Windows 8 I have been regretting not taking this same bold step. I didn’t want to learn a new OS, I am just not interested enough, but Windows 8 is so different anyway and so just plain bad, that learning a new OS would probably have been easier! Word and Excel have become so laden with unnecessary “bloatware” that learning a new package would probably be worth it too. I had a similar experience at work. I used Windows 97 and then XP and was relatively happy with it but work kept upgrading their software and every upgrade made it progressively more unfriendly and complicated. So much time and effort was wasted by everyone trying to do what was always had been a simple task and lots of people just never regained their former skills. I always hated Word and Excel, they are full of bloated nonsense that 99% of people don’t ever need and were often complicated and bug-ridden too. I remember in the 1980’s having a word processor on a Commodore 64 computer which had just 64K for the entire computer (about the same as an email today). It’s just ridiculous that Office takes up hundreds of MB to do something similar. I’d definitely go with a Mac next time even from my position of starting from scratch. I see many of the web-retailers offer Office for Windows. They seem to be missing the entire point of switching over!!! We switched about two years ago after getting so, so tired of virus/spyware needs, sluggish Window (They get bogged down with crap so easily it seems. ), and having to re-buy every 4 years or so. So after enjoying my iPhone so much, we took the plunge. I’m so glad to hear your story Mike. Mine was very similar but with iPod and iPads instead. It is the best computer decision I have taken for decades. You’re right too about the virus and spyware problems and the comatose inducing Windows. After nearly a month, I have had no security alerts, system errors, crashes or unwanted occurrences. I also really like that when I get up in the morning I just click on the mouse and the machine is ready to use in less than a second with none of the faffing about of Windows. Unfortunately, we will have to keep a Windows PC at home, as the kids only use Windows at school. Hey ho. Oh and all they do is moan about rubbish it is! Hi there, my closest cyber stalker 🙂 Nice to hear from you. I get thousands of lurkers every week… haven’t a clue who most of them are! I’m glad the Macs have been such a success at yours, doubly so if they were freebies. I can imagine mine will go on much past the stage I might want a shinier model.